HofArc’s new Living Vehicle may just be the future of off-grid living thanks to its dynamic combination of glossy aluminum cladding, eco-friendly materials and self-sustaining features. The stunningly sophisticated home on wheels was built with low-impact materials meant to last a lifetime, and it can be equipped to go off grid for weeks at a time. HofArc’s founder, Matthew Hoffman, has spent years living and designing modern, mobile living spaces. The Living Vehicle design is the result of years of fine-tuning small spaces so that they make little impact on the environment, but without sacrificing on comfort. 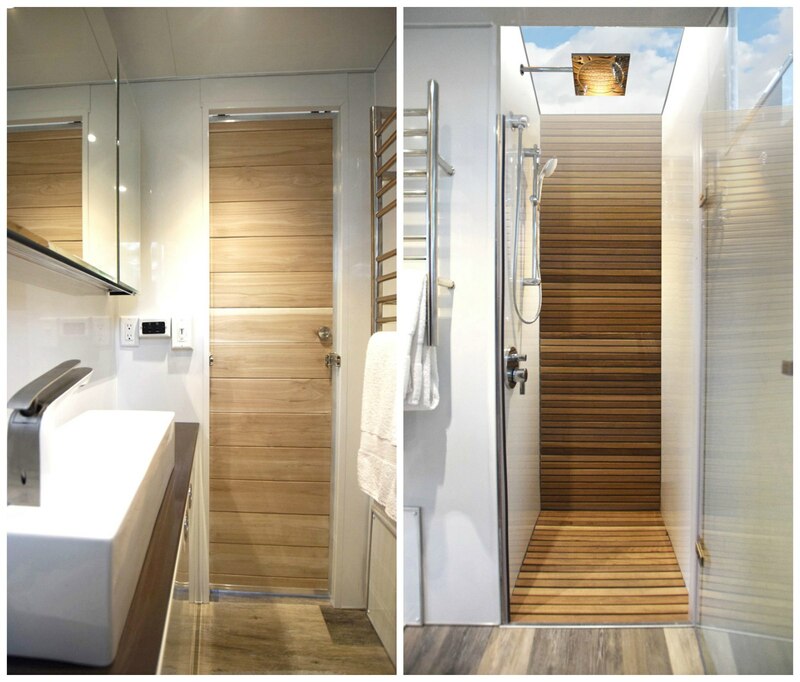 The 215-square-feet long camper is clad in ultra-glossy aluminum – a durable, long-lasting, and recyclable product. No only aesthetically pleasing, this shiny facade also helps reflect light and heat, aiding in the trailer’s energy regulation. The high-quality aluminum, along with superior engineering, provides a strong, rigid frame for the RV that can withstand even the most rugged off-road expeditions. 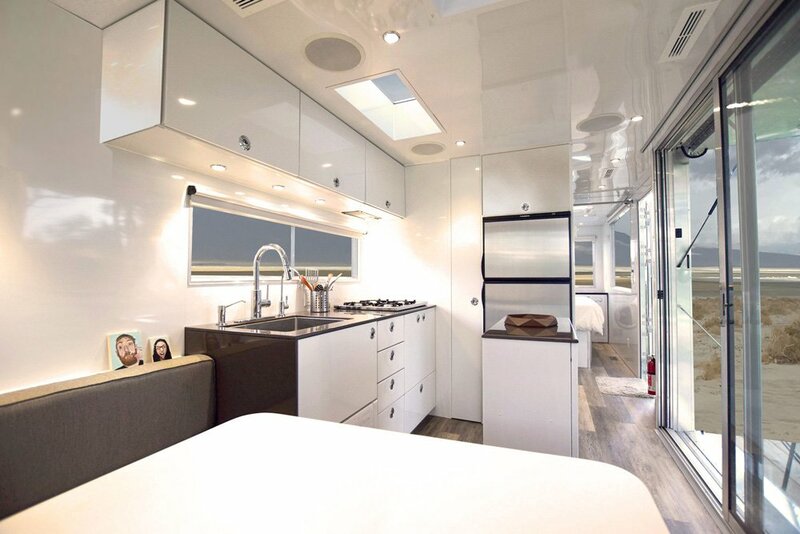 Designed to go off grid for weeks at a time, the camper is equipped with ample energy production and storage features including four 150-watt solar panels, four 12-volt lithium ion batteries, and a 3000-watt power inverter. It also comes with a 100-gallon tanks for water storage. Thanks to its ultra-strong insulation, the LV is a comfortable living space all year round. The LV’s interior is not too shabby either. Using many of the tried and true space saving techniques found in RV’s, the LV design goes further on comfort. The kitchen has enough space for a full-sized refrigerator, sink, and stove. An island with counter top is handy for food preparation and provides extra storage space. The living area is light and airy thanks to the large windows. And for sleeping space, there are enough convertible beds to sleep six. Although currently not an option, the HofArc team hopes to modify the current design over the next few years so that the LV can produce its own water and food, therefore converting into a 100% self-sustaining home on wheels. Combining a glossy aluminum cladding with eco-friendly materials and self-sustaining features, HofArc's new Living Vehicle trailer may just be the future of off-grid living. The stunningly sophisticated home on wheels was built with low-impact materials meant to last a lifetime and can be equipped to go off grid for weeks of a time. HofArc's founder, Matthew Hoffman, has spent years living and designing modern, mobile living spaces. The Living Vehicle design is the result of years of fine-tuning small spaces so that they make little impact on the environment, but without sacrificing on comfort. 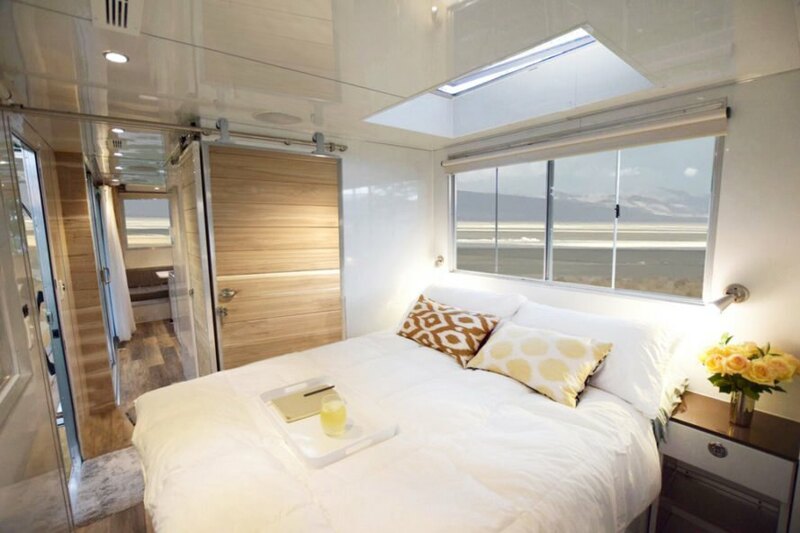 The 215-square-feet long camper is clad in ultra-glossy aluminum - a durable, long-lasting, and recyclable product. The LV interior is light and airy, thanks to the many windows. No only aesthetically pleasing, this shiny facade also helps reflect light and heat, aiding in the trailer's energy regulation. Designed to go off grid for weeks at a time, the camper is equipped with ample energy production and storage features including four 150-watt solar panels, four 12-volt lithium ion batteries, and a 3000-watt power inverter. It also comes with a 100-gallon tanks for water storage. The LV's interior is not too shabby either. Using many of the tried and true space saving techniques found in RV's, the LV design goes further on comfort. The kitchen has enough space for a full-sized refrigerator, sink, and stove. An island with counter top is handy for food preparation and provides extra storage space. The living area is light and airy thanks to the large windows. And for sleeping space, there are enough convertible beds to sleep six. 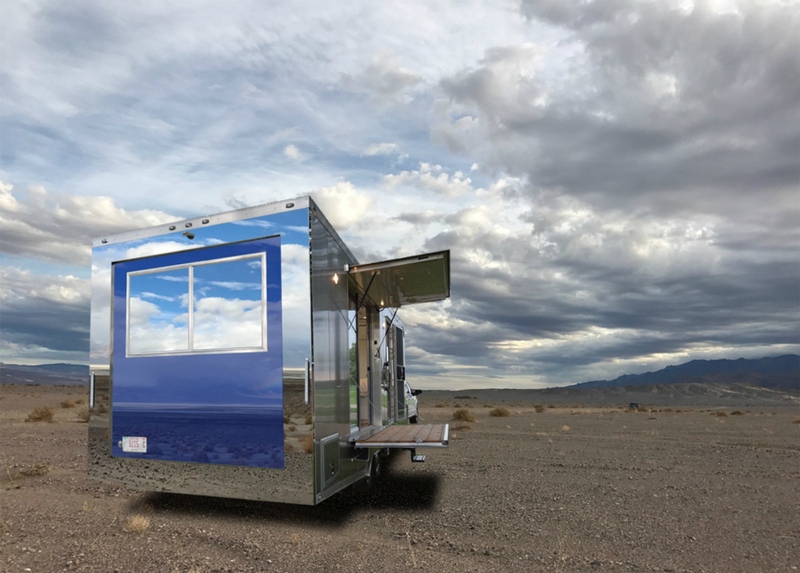 Although currently not an option, the HofArc team hopes to modify the current design over the next few years so that the LV can produce its own water and food, therefore converting into a 100% self-sustaining home on wheels. There is a small raised wooden deck that leads to the interior. The Living Vehicle has a surprising amount of storage space. Designed to go off grid for weeks at a time, the camper is equipped with ample energy production and storage features including four 150-watt solar panels, four 12-volt lithium ion batteries, and a 3000-watt power inverter. 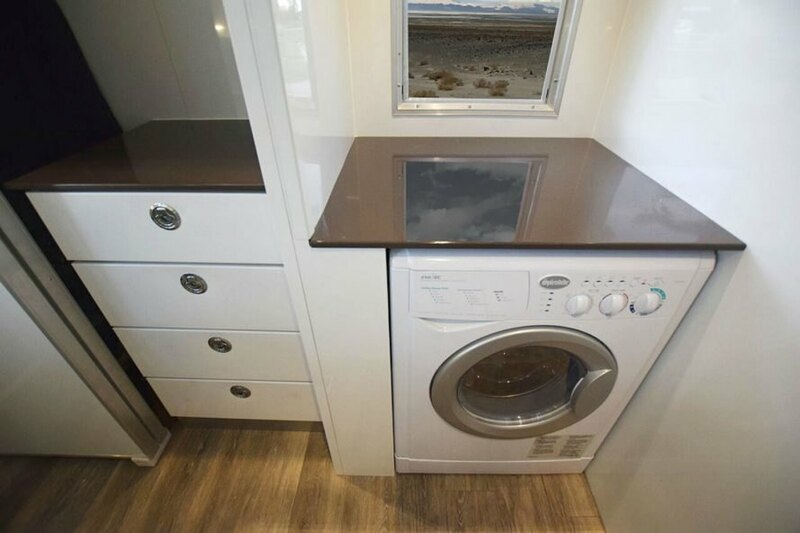 Using many of the tried and true space saving techniques found in RV's, the LV design goes further on comfort. The LV comes with enough convertible beds to sleep six. 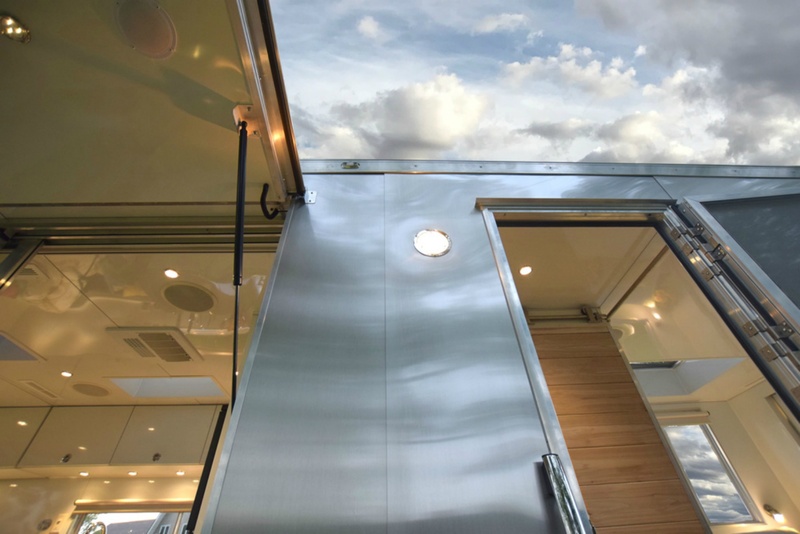 HofArc's new Living Vehicle may just be the future of off-grid living thanks to its dynamic combination of glossy aluminum cladding, eco-friendly materials and self-sustaining features. 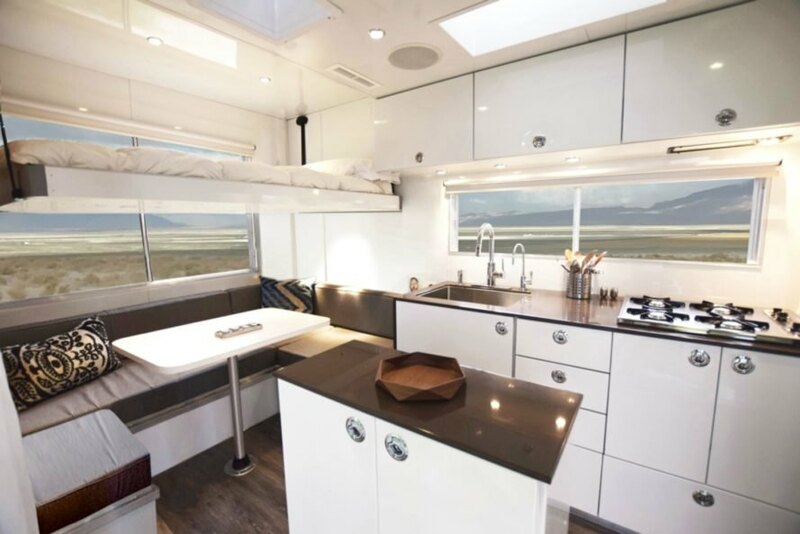 The stunningly sophisticated home on wheels was built with low-impact materials meant to last a lifetime, and it can be equipped to go off grid for weeks at a time.